KETCHIKAN — Ketchikan can't seem to get enough of Bawden Street Brewing Co., the city's first brewery in more than 15 years. 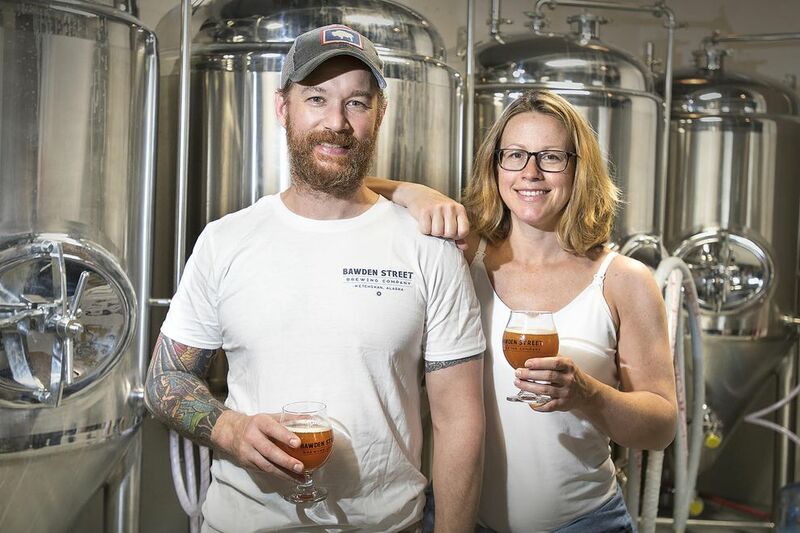 And while the brewery is primarily geared toward producing beer for other businesses to sell, its taproom and storefront has proven popular with locals and cruise ship passengers alike. From the company's downtown location on the first floor of the Welsh Whiteley Architects building, customers are legally allowed to drink up to 36 ounces and take up to 5 gallons to go. Each new batch has sold quickly, with some selling out in a matter of days. The business's early successes are more remarkable given that much of the operation is run by one man. 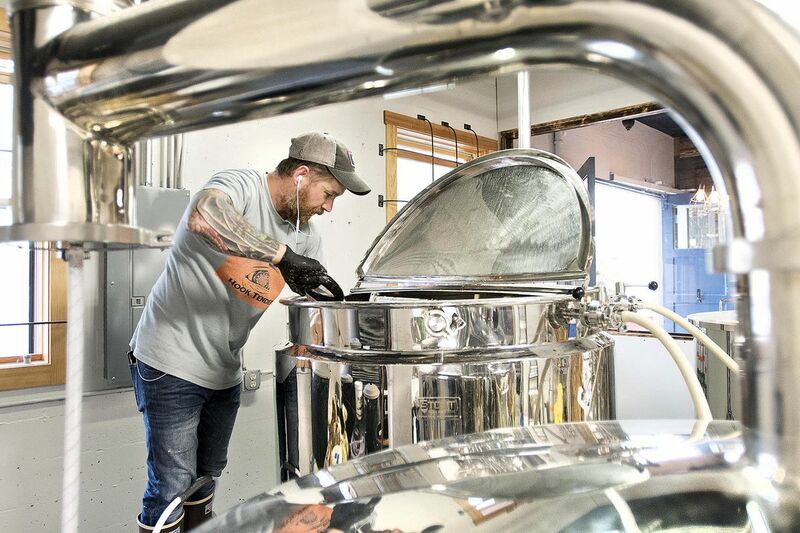 Sean Heismann — owner, operator and lone brewer — has been busy. When the Ketchikan Daily News stopped by on a recent afternoon, Heismann was, in his words, "running around the brewhouse like a madman." With only two employees, both of whom handle front-of-the-house operations, Heismann says his responsibilities span from digital marketing to intellectual property law research to manual labor. He is making the giant leap from a homebrew hobby to a small business. And all this has coincided with his wife giving birth to the couple's first child in early July. Heismann said he's been able to take on so much in part because of support from the brewing community. For example, he's received advice from other brewers around the country. "It's one of the few industries, I think, where there's a real cooperative competitiveness," Heismann said. "So, I want to make a better IPA or imperial stout than the next guy, but if I ask them, 'Hey man, how did you make that recipe?' — they'll tell you." He's received help from local community members, too. These include hardware stores, bars, general retail stores, graphic designers, sign manufacturers, neighbors and beer drinkers who have given him feedback. "I've lived everywhere from southern Ohio, upstate New York, Los Angeles, Philadelphia, Army bases all over the world — and the best people I've found have been here," Heismann said. "Like, the nicest, the most willing to help, eager to share, and actual, real sense of community that isn't just lip service." "It's been really gratifying to see that there are those kind of people still out there in the world, and they all happen to live here," he said. Heismann and his wife, Nicole Morin, moved to Ketchikan about two years ago when Morin took a job at the PeaceHealth Ketchikan Medical Center. Heismann had been brewing as an amateur for a couple of years. One day, after trying Heismann's homebrewed imperial stout, a neighbor casually recommended that he start a brewery. "And because I'm an idiot who didn't know what was involved in that, I was like, 'Yeah, OK,' " Heismann said. He began setting up the business in June 2017 — the year-plus-long process would involve jumping through a few of what he called "fiery hoops." He became immersed in a complex licensing process involving authorization from a number of local, state and federal entities. He also narrowly avoided a lawsuit over the brewery's original name, Inside Passage Brewing Co.
After some delays, on July 9, 2018, three days after the birth of his daughter, Heismann at last tasted Bawden Street Brewing's first batch of beer. He said the moment nearly brought him to tears (though he admitted sleep deprivation may have been a factor). Heismann is still adapting to his new, higher-volume equipment, which can yield surprisingly different results from what he's been used to. He's now focused on perfecting four beers and plans to make sure they are consistent before moving on to other recipes. Two of the four current beers are saisons, a favorite style of Heismann's. A saison — meaning "season" — is typically a light, refreshing, highly carbonated and sometimes spicy or fruity ale. The style originated in 18th-century Belgium, where seasonal farmhands drank it in place of water during the summer, Heismann said. Bawden Street's Citra Saison is made from citra hops, which provide a "citrus-pineapple-orange" taste and a clean, bitter finish, Heismann says, while the Hook Tender Saison has a sauvignon blanc flavor on a relatively simple saison base. "I like the funky, farmhouse style," Heismann said of saisons. "… I like stuff that's a little raw and unrefined. So you're not going to get a flash-pasteurized product that looks like crystal-clear water. You're going to get something that's a little murky, a little cloudy." The Biere de Garde Amber has been popular — Heismann said that he sold out of his initial batch of 155 gallons at the taproom in four days. The Mark IV IPA has also been a customer favorite. Heismann said he hopes to develop a dozen or more distinct, well-crafted beers for the menu, but that for the sake of quality, he could pare that number down to as few as six of his best. Also part of the business plan: giving back to the community that helped the business get started. Heismann, an Army veteran, said supporting veterans groups like the local chapters of the Veterans of Foreign Wars and the American Legion is a high priority. He also plans to partner with arts groups like First City Players and the Ketchikan Area Arts and Humanities Council. While Bawden Street Brewing is currently the only operational brewery in Ketchikan, there are currently at least two others potentially on the horizon: Erleninsel Brewing and Baleen Brewing near Clover Pass. "We definitely need it," he said. "There's no reason why we can't have it. … This town is big enough and sees enough tourist throughput. And as a fishing town with a drinking problem, we can support three or maybe four small breweries." Asked why he seems eager for more competitors, Heismann returned to the idea of community. Partly, it's wanting more people to talk about beer with. "Again, it's the cooperative competition. There's something about beer geeks talking about beer — it's like watching nerds in love. … We almost worry more about the quality of the product and the type of the product and how we made the product than, 'Am I going to make more money than the next guy?' People are always going to drink around here. Not a worry. I'm doing this because I'm absolutely passionate about it." "Seriously," he said. "If there's anyone else who's thinking about doing this, come talk to me."